WilleZurMacht are a German duo, being Nicolas Perrault (sounds very German indeed, haha) (double bass, bass guitar, trombone, vocals) and Dominik Klein (guitars, effects), which had not released anything official yet, I think. I Will Kill Chita are a Russian instrumental Post-Rock band (Nikita Samarin – drums, Nick Samarin – guitars & bass, Andrew Silin – keyboards, Theremin, and Artem Litvakovsky – cello, guitars & noises), and they are active since 2010 (actually as IWKC), with two hands full of official releases in the meantime. Both acts met in 2014 during a modest festival, and they decided to do something together. Soon after they did. Two Bridges is an improvised concept album (no overdubs), a collaboration of both projects, recorded in less than a week at the Church Ov Drone Records Studio. 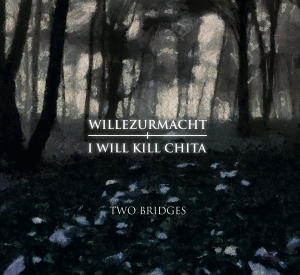 The recordings (six titles, eventually) were engineered, mixed and mastered by I Will Kill Chita frontman Nick, and the result lasts for fifty-two minutes. The sound quality is very clean, yet not too clinical, just decent and solid. The six pieces are quite differing from each other, all of them having an own identity, yet still there is a certain coherence, which is good thing, evidently. Opener Siebente Einsamkeit is a weird thing to start with. It brings some avant-gardist form of Progressive Rock, played quite slow yet intense as sonic experience. On a basement of repetitive rhythms (great bass lines and cool drumming, dudes! ), you’ll get confronted with some spacy tune throughout the whole track. It’s like Hashshashin being covered by Yurei. Morgenröte, then again, is quite different. The first part of this track reminds me of the hallucinoid long-form drones à la Aidan Baker and the likes, once again injected by those spacy noises. The second part is within the very same vein, yet with a clear touch of I Will Kill Chita’s Post-Prog melodicism. Als Ich Einst Abschied Nahm has something deeply melancholic. It’s an expression of soberness, desperation and even introspection, based on dreamy guitar lines, assisted by a finely supportive rhythm section and some atmospheric synth lines. Ein Abgrund Ohne Schranken makes you almost fall into a bottomless depth. Here too a certain sadness paints the general sphere, yet it’s more of an introvert kind rather than based on loss and mourning, I think. This track is one that slowly grows, despite the basic repetition of the fundamental structures of this epic piece. Warm Atmet Der Fels is the most ‘loungy’ piece of the album, much more enlightening than both former compositions, and pretty floaty. My personal favourite (for what it’s worth to you)) is the final track, however, which is the longest piece too on Two Bridges (just over eighteen minutes of length). Die Wüste Wächst has nothing to do with progressive things whatsoever, yet dwells within the regions of ominous Drone Music. Just like Morgenröte, this song is like a bewitching, captivating trip with a burdened atmosphere. Notwithstanding the long duration, this elegy permanently evolves, appending subtle element to enrich the totality. As from the second half, the fullness climbs up to a certain peak, slowly and subtly, even including enthralling voices for the first time. Two Bridges is not an easy, evident listening experience. It combines elements from Doom, Post-Rock, Progressive and Drone, veiled in a sober, yet spiritual package. Several listens are recommended to understand the essence. But it has been created in an improvised setting and that shows the involved members’ craftsmanship. Give it a try!